September 2017: WTIA subscribers were informed that Bitcoin below 3,000 would likely find support and would thus be a good opportunity for buyers to load up and ride it above previous high over 5K. 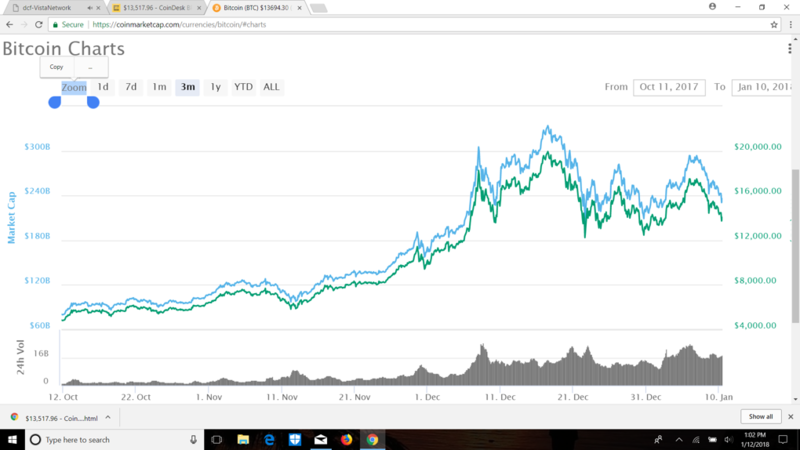 10 December 2017: WTIA subscribers were informed via email and Twitter (still posted) that Bitcoin would likely find support at a new higher low around $13,500 and rise above new higher high over $15,500. Most subscribers sold over $20,000 per coin, or at a “stop loss” of $17,500. Now, as you can see on the chart below, Bitcoin is seeking consolidation again, likely around the higher lows you see there, once again around 13,500. So without a crystal ball, I would likely be a buyer again below there, perhaps as low as 12,500 to 12,000? However if it goes lower, I would most likely hold off and wait to see if it finds support (buyers) back above 12,500 to 13,500? In the end, Bitcoin is a store of value, more so than an “investment”, and most subscribers of WTIA acquired theirs FREE or below 3K per coin, following my previous recommendations. Neither bragging nor complaining, just explaining.